Posted on December 14, 2017 at 8:51 pm. Peppermint Oobleck: We mixed cornstarch, water and candy canes together. It became a solid. No wait it became a liquid. Wait, it became both! We were able to pick up solid a chunk and pack it into a ball, but as soon as we stopped forming the ball it oozed into a liquid. 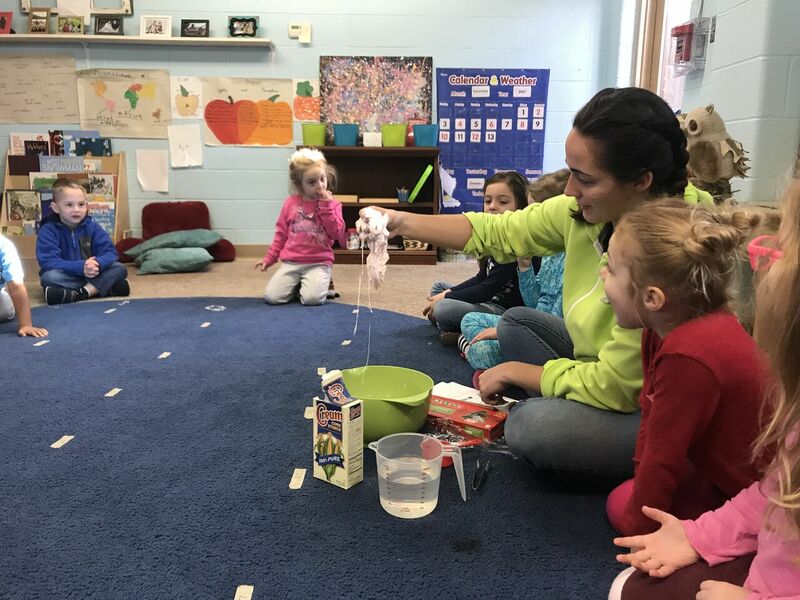 The children learned that this is called a non-newtonian liquid, which is a substance that acts like both a liquid and a solid. Posted on December 1, 2017 at 3:40 pm. We enjoyed our time in Science class this month! Check out some of what we learned! When we gently squeezed the bottle the packet of ketchup sank. 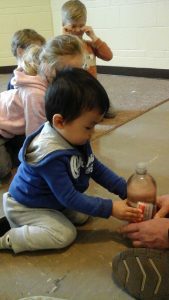 When we released the bottle the packet rose to the top of the bottle. When we put soap on the Q-tip and dipped it, the pepper scattered. Students also loved our “disapearing packing peanuts” experiment! When you put the packing peanuts in water, they disappear. Why? Because the packing peanuts are made out of corn starch or potato starch. The water dissolves the starch. 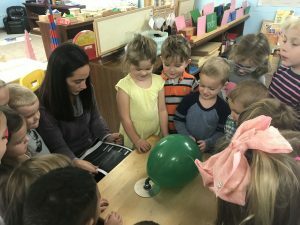 What a great month exploring science with our friends! Posted on November 30, 2017 at 7:02 pm. 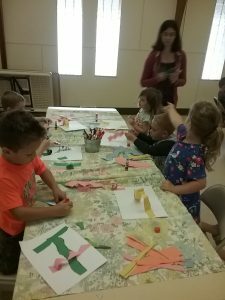 For the month of November we will be working with shapes and practicing our cutting and gluing skills! Our first project, creating a circle collage, utilized both of these skills as well as stamping circles with paints! 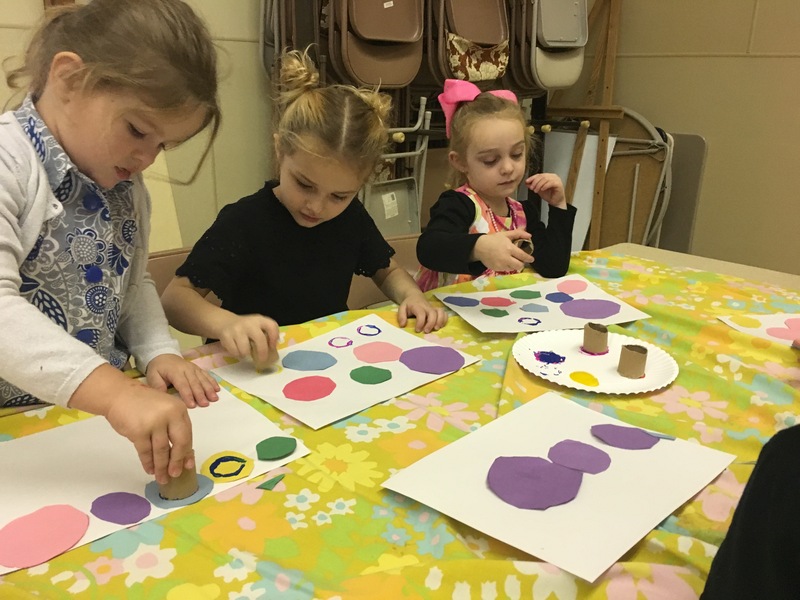 The students practiced cutting circles and gluing them, then stamping circles at the end to create a collage. We read the book Little Owl’s Night by Divya Srinivasan and worked with shapes to create owls of our own! 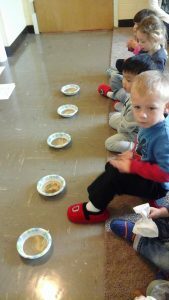 The students tore squares of brown paper to create the owls body and wings. They cut circles for the eyes and glued rectangles for the legs. Each owl turned out so different! 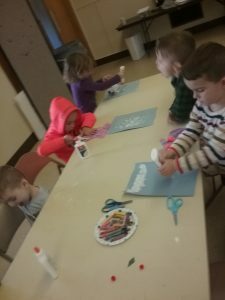 Our last project of the month began with the story The Mitten by Jan Brett, a winter classic! 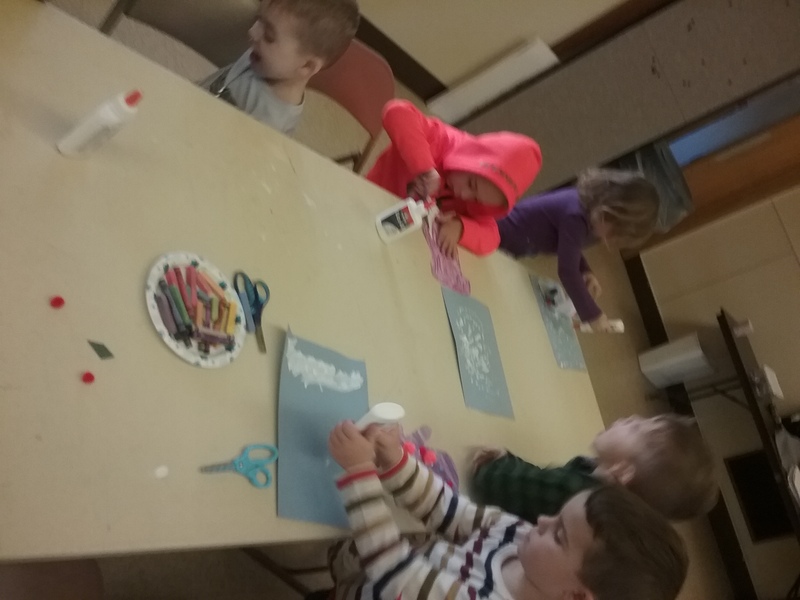 The students began our mitten project by using q-tips to stamp circles of snow onto our sky background. 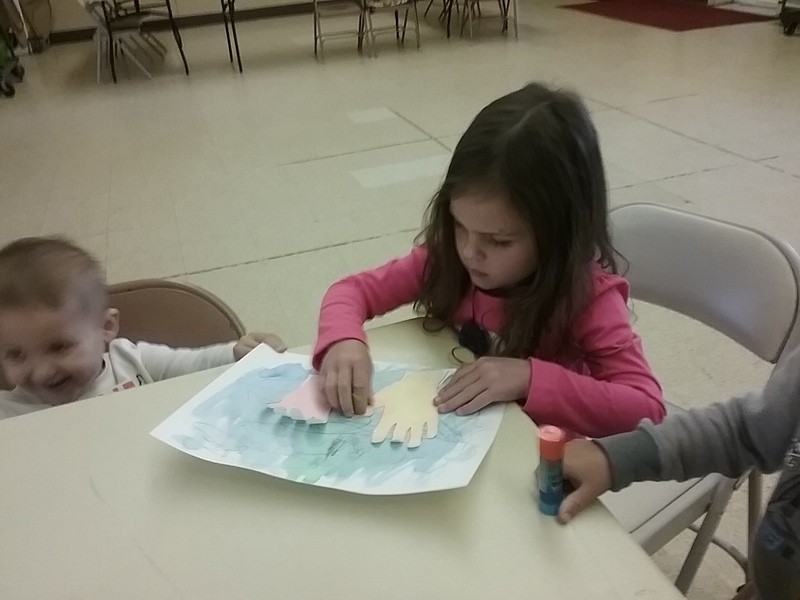 Then they experimented with chalk pastels to create a colorful, blended mitten. 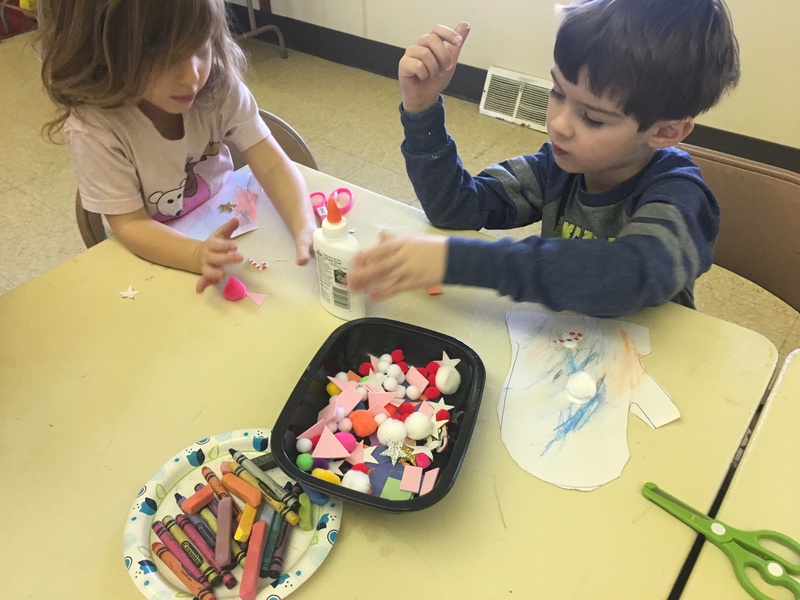 After cutting out their mittens they decorated them with construction shapes, stickers and pom poms. We glued our mittens to our snowy blue sky background, just like Nicky’s mitten flying through the sky in the story! Posted on November 30, 2017 at 6:56 pm. November was a fun filled month for music. 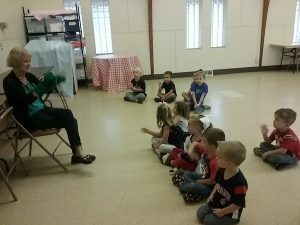 Miss Lisa started teaching us some new songs from her CD. The theme this year is Love, Family and Friends. While singing the songs we also focused on using instruments, learning the beat of songs and fun dances! This month we received our new Music CD from Miss Lisa. 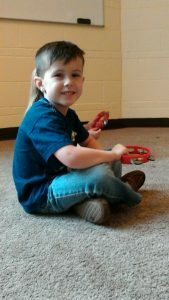 This year Miss Lisa is focusing on family and friends in her songs. 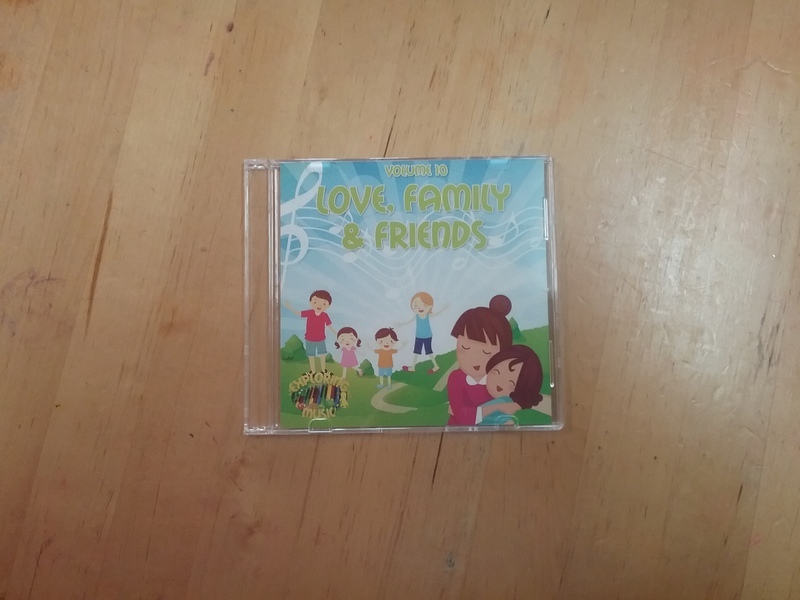 On this CD are many of the songs we sing in music class. Some of these songs are classics from when you were young and some are familiar tunes with a fun twist on the lyrics to incorporate her theme. Later on this year, Miss Lisa will have a surprise to go along with track 2, Sophie the Yorkie Story. We started off with track 3 from the CD Boom Boom Ain’t It Great To Be Family. After learning the words, Miss Lisa introduced rhythm and melody to us. 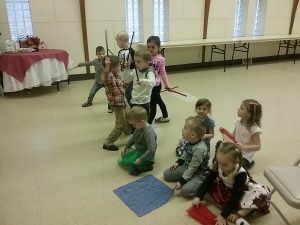 Half the class followed the rhythm with rhythm sticks and the other half listened for the melody and danced with scarves when the heard it. 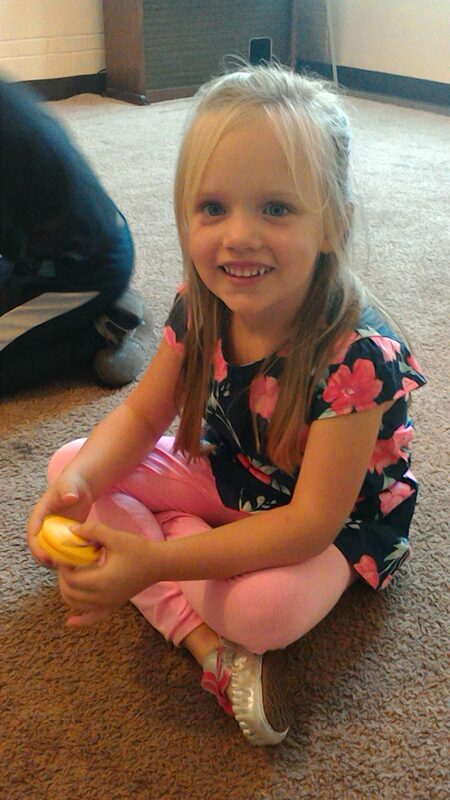 Listen to this great song and see if you can identify the parts with your child! 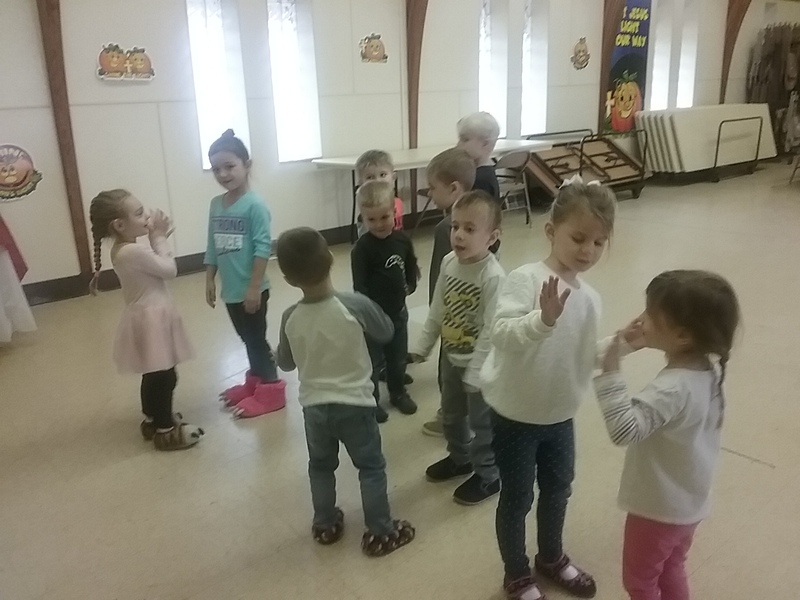 We also learned a short dance to go along with the song as well. Dancing with a partner was so much fun. 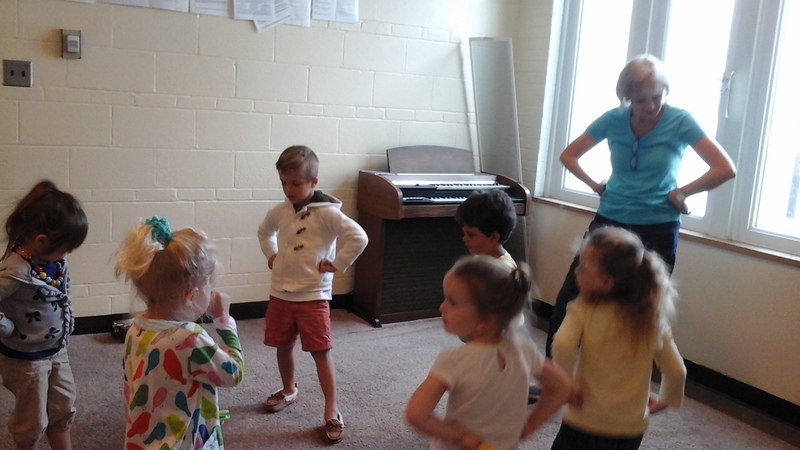 It was tricky at first to learn the moves, but eventually the moves helped us learn the words of the song better! Later in the month we started to learn songs that involved movement and an instrument. We had to keep our eyes on Miss Lisa for this one! 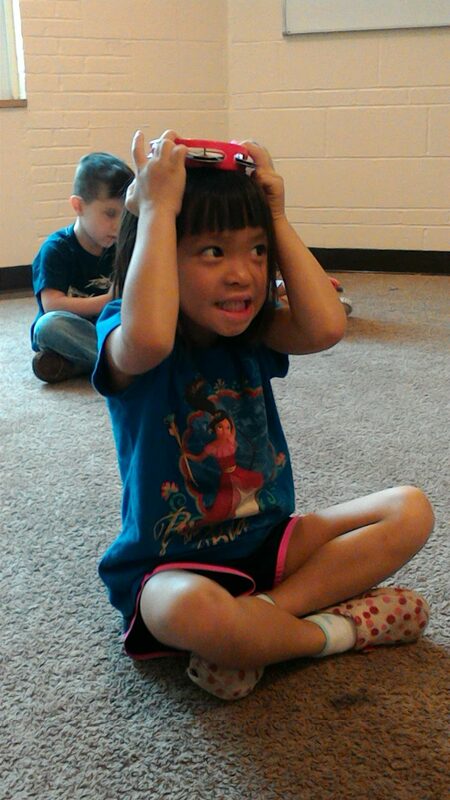 We ended our month with learning two different versions of Jingle Bells. One we used bells and the other we played freeze dance with. We also learned Rudolph the Red Nosed Reindeer with some sweet dance moves. We can’t wait to sing Miss Lisa our songs for our show at the end December. Posted on November 29, 2017 at 3:59 pm. us understand our emotions and shared with each other our favorite colors. We also talked about how sometimes we feel sad or happy or tired and how we can feel more than one emotion at a time! As a class we shared how we were feeling that morning and then used those colors to create our very own colorful masterpiece! 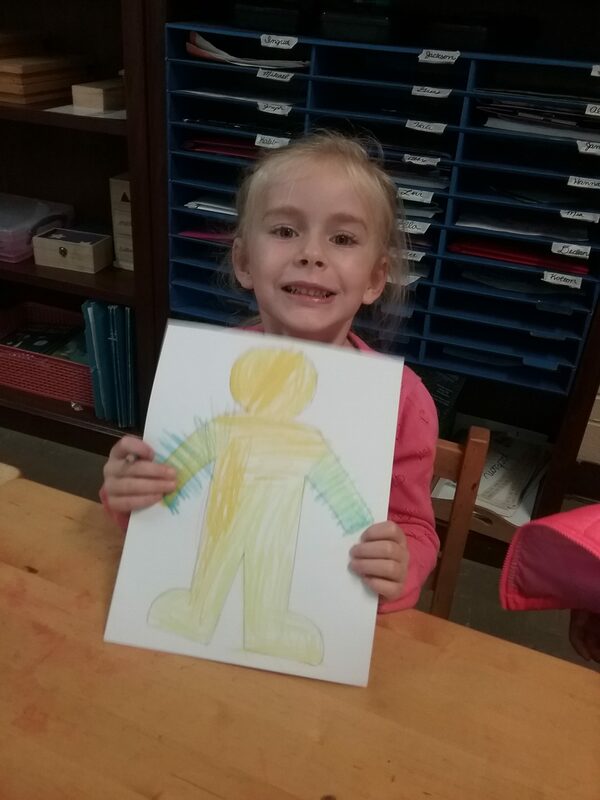 We continued our unit on creating “Colorful Masterpieces” with a lesson on lines. Lines are everywhere! All around us! 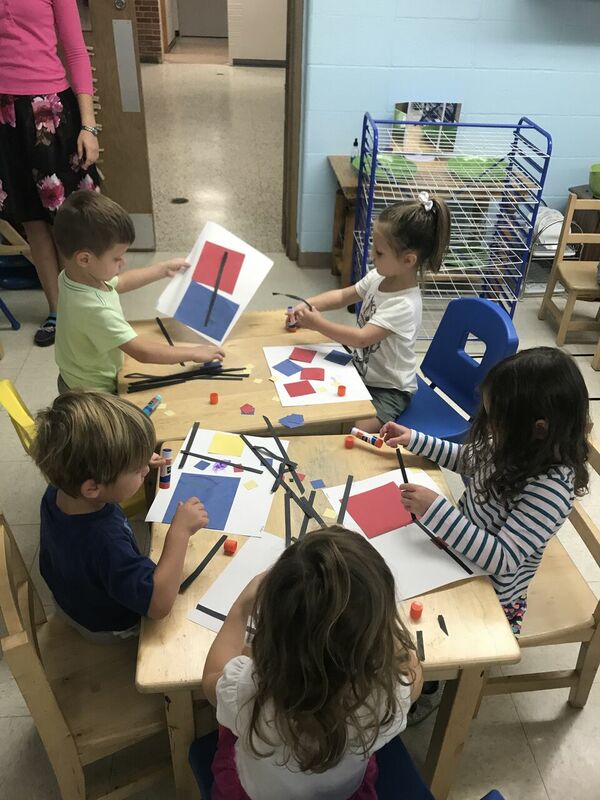 There are so many different types of lines, which we discussed while matching examples to the lesson board.With the intention of practicing some basic cutting and gluing skills our project began with cutting out different types of lines. We worked on holding our scissors properly and following the black lines on the construction paper. 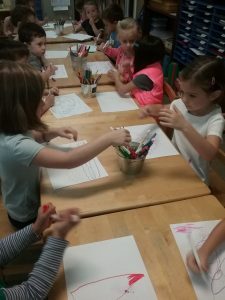 Using glue sticks, the students created a line collage! 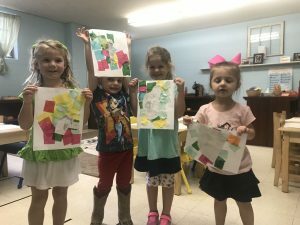 After demonstrating a few collage techniques (creating a paper spiral, folding the paper accordion like, rolling the paper) it was exciting to see each student incorporate those types of lines into their collages. 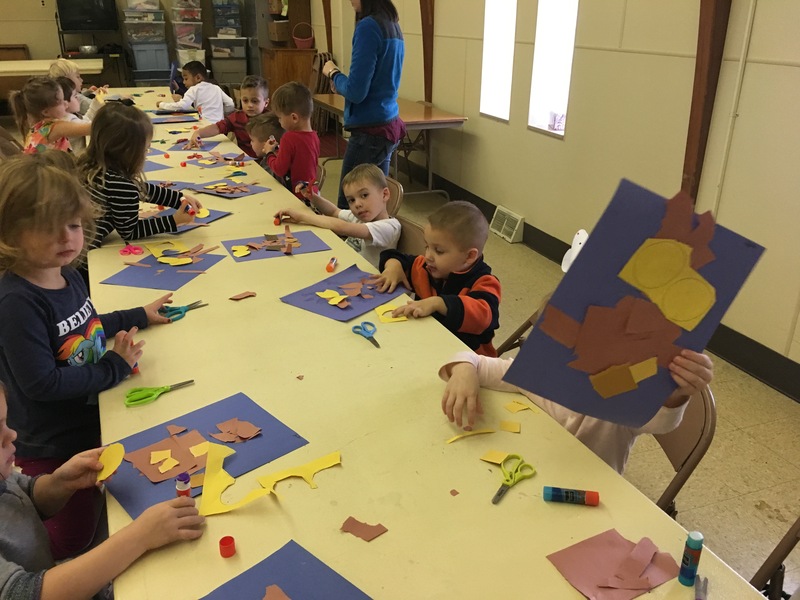 Each student ended up with a 3D line collage that they cut, folded and glued together themselves! 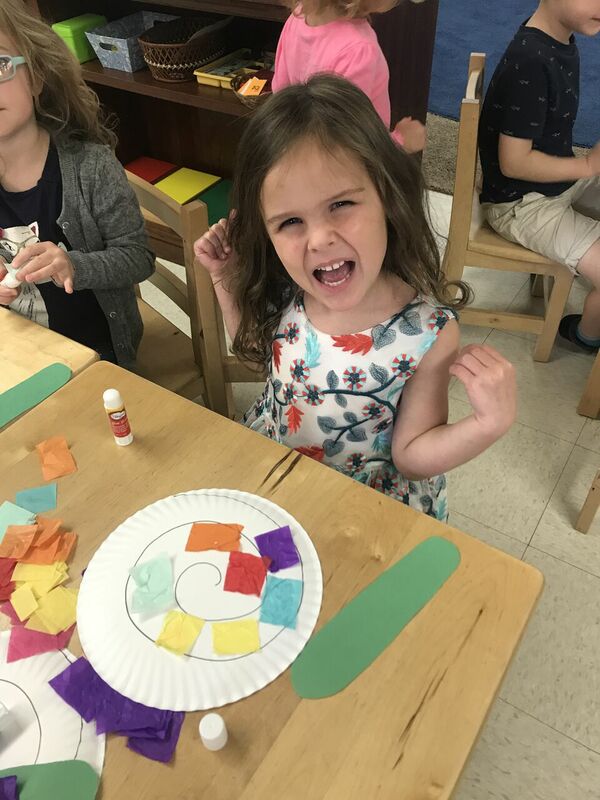 Our third lesson in our unit on “Colorful Masterpieces” began with a discussion about the color wheel and more specifically warm and cool colors. 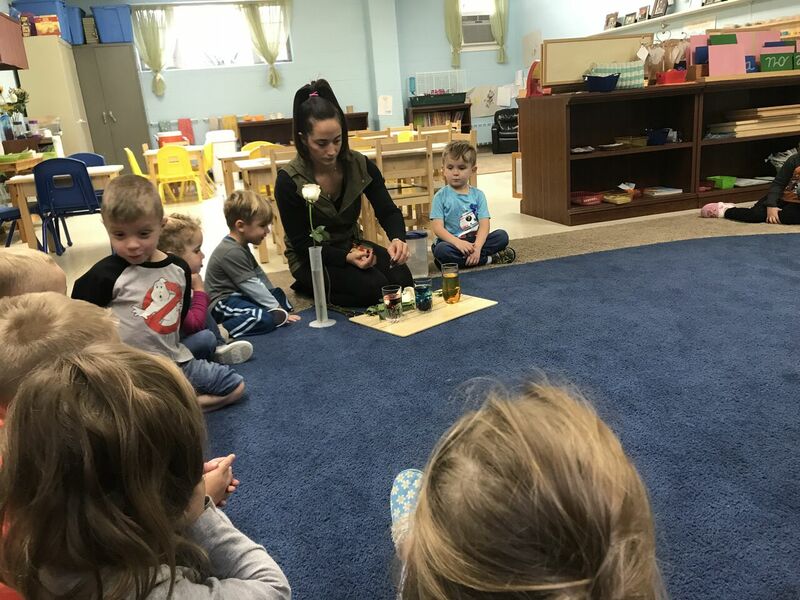 We talked about what a warm and cool color is and looked at examples of famous paintings that were good examples of each, including paintings from Picasso’s Blue Period and Van Gogh’s warm sunflower paintings. 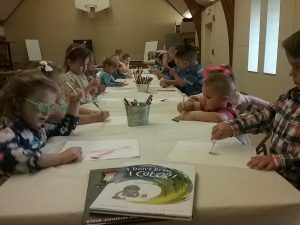 Using lines, we drew and then painted lines onto watercolor paper using only cool colors. It was neat to see how the cool colors mixed together! 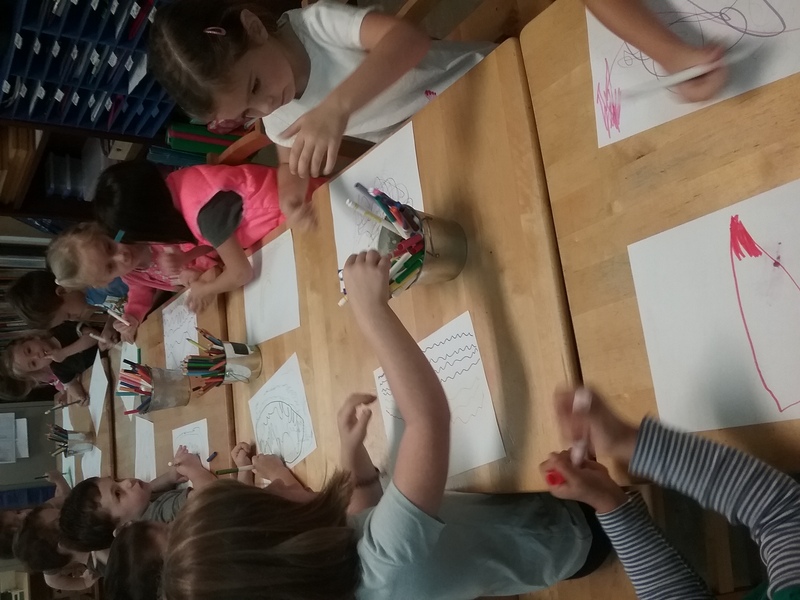 Next we traced our hands onto a separate paper and painted them in warm colors. 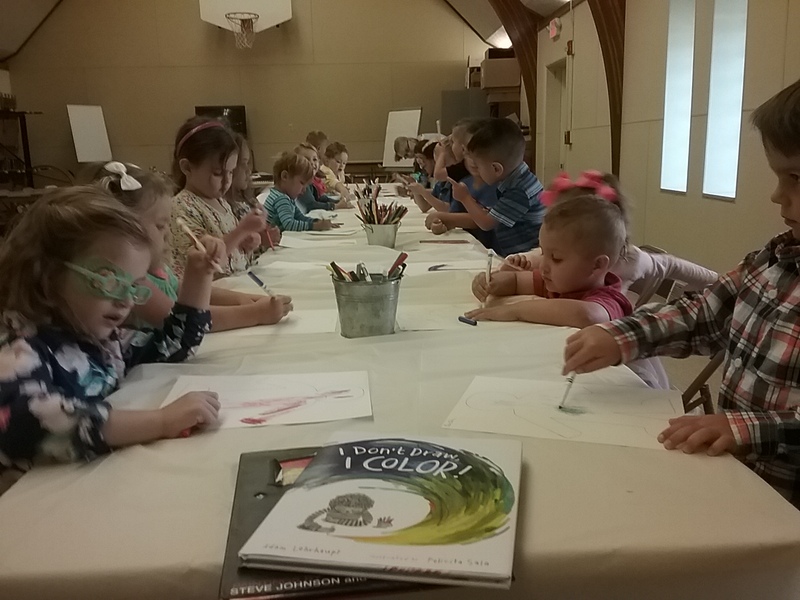 After cutting our hands out the students glued them onto their lined cool color painting. 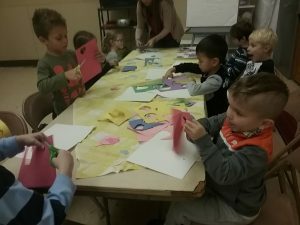 Our end result was truly a masterpiece of warm and cool colors, the little hands making the project all the more special! In the spirit of it being the week of our Halloween parties we worked on cutting and gluing shapes as well as painting pumpkins to create our own nighttime pumpkin patch! This week we talked about the changing leaves and colors around us when we go outside to play. 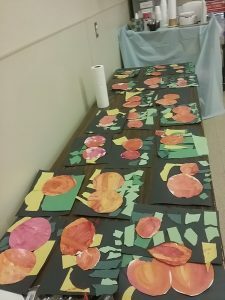 We used these colors to create a fall tree collage! 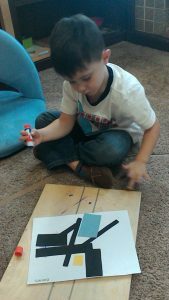 Practicing our gluing, cutting and drawing skills the students worked hard at creating their final project. 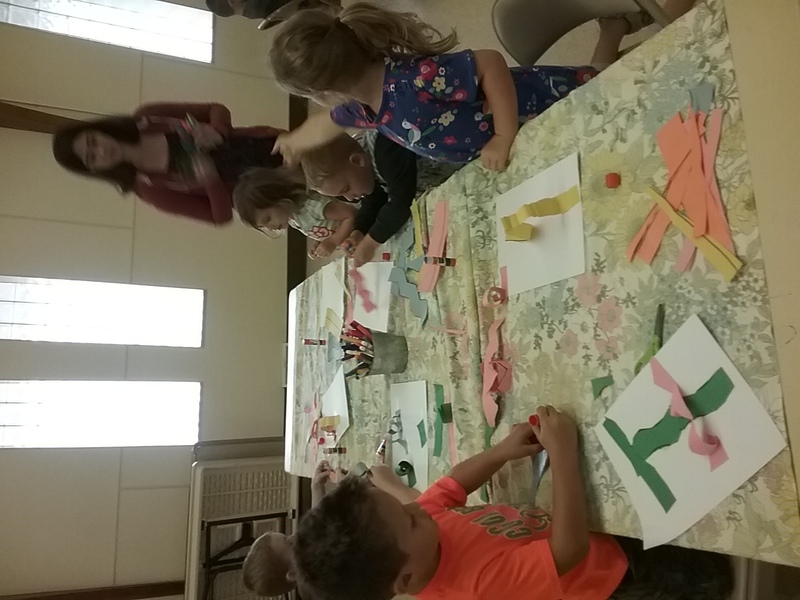 We began with gluing the grass and sky using square tissue papers. 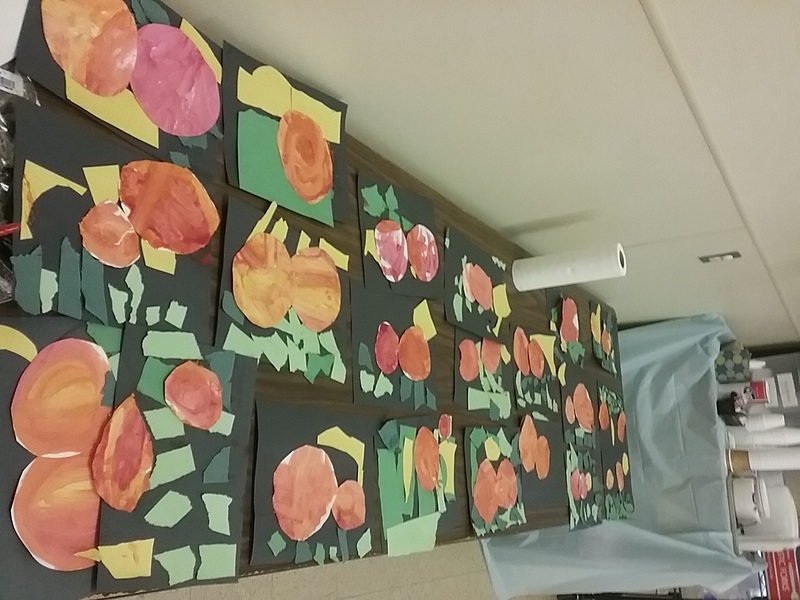 Then we drew circles on red, orange and yellow papers to cut and glue down for our fall trees. We finished our projects using brown tree trunks and drawing lines on our trees for branches. 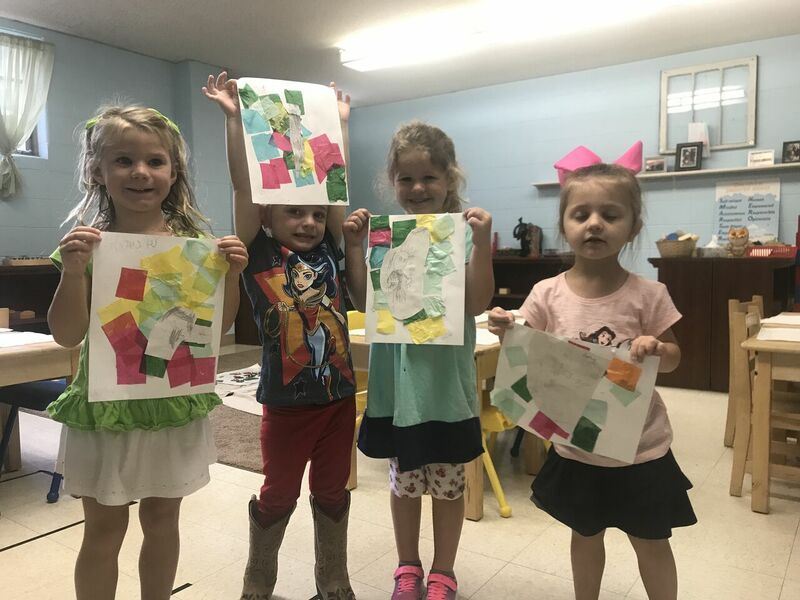 Such a fun project that involved many of our basic art skills! Posted on November 3, 2017 at 5:14 pm. 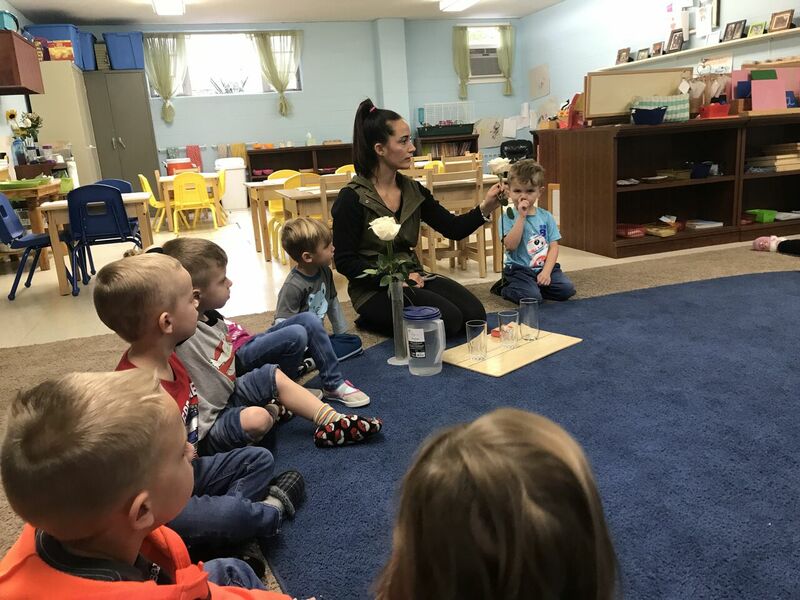 Color changing flower: We took white roses and placed them in water with food coloring. The next day the children discovered that the flowers had taken on the color of the food coloring they were placed in: yellow, blue and red. 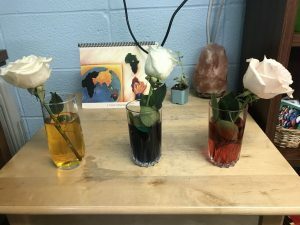 The reason the petals of the roses changed colors was because the food colored water had traveled up the stem and into the petals. 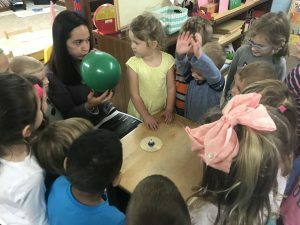 Tabletop hovercraft: We hot glued a bottle cap to an old CD and then blew up a balloon and attached it to the bottle cap. 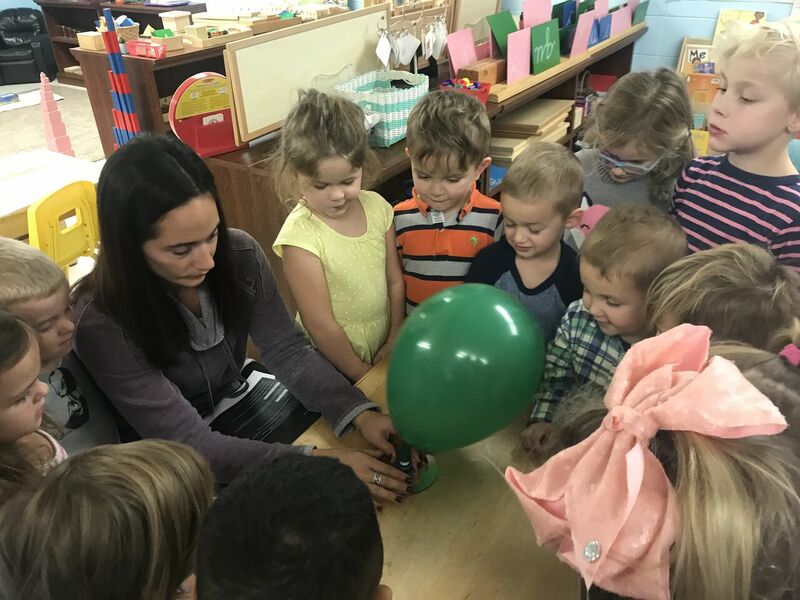 When we slowly opened the bottle cap air flowed out of the balloon creating a cushion of moving air between the CD and the table. This reduced the friction allowing the CD to hover freely over the table. Posted on November 3, 2017 at 5:02 pm. Every Tuesday we have music with Miss Lisa. Half of our classes go in the morning and the other half goes in the afternoon. Here is what we have been up to this month! This month we started off with learning the terms ‘adagio’ and ‘andante’. Adagio means slow and andante means medium. We also learned the term ‘Allegra’, which means fast. 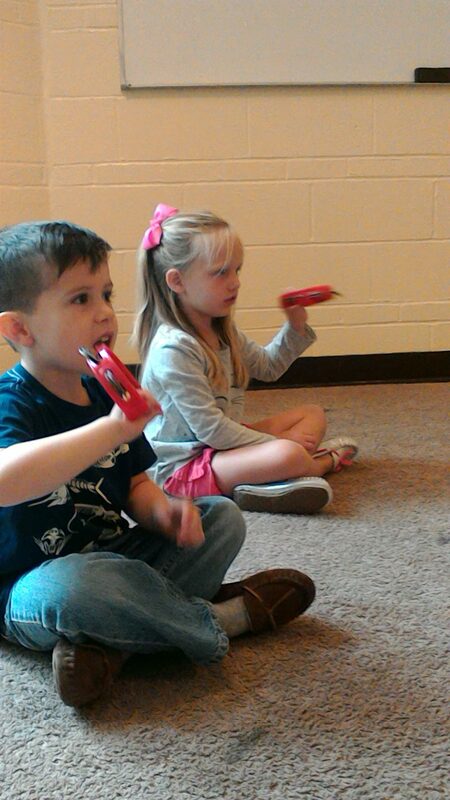 We practiced these different speeds with the song “She’ll be Coming Around the Mountain” and playing the tambourine. 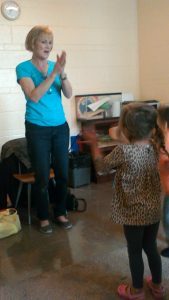 The second week of October Miss Lisa introduced us to a couple of new songs involving counting and hand movements! We sang Allison’s Camel, Knick-Knock-Paddy Wack, The More We Get Together and 3 Little Monkeys. We loved using our fingers to count the different things in each song! We also learned a few new dances that went along with these songs. 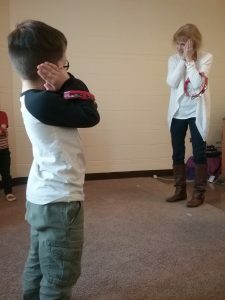 We love all the movement that Miss Lisa incorporates into her lessons! 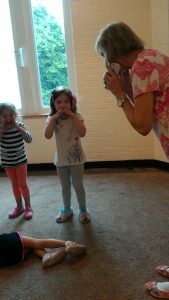 We all have really started to learn the words to the songs and are having so much fun singing along with Miss Lisa. We also reviewed the words ‘piano’ which means soft/quiet and ‘forte’ which means loud. We also had a short discussion about how all of the music words we are learning are Italian. 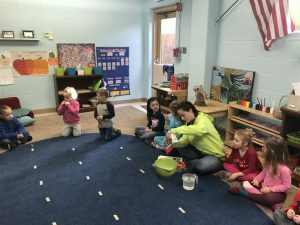 Miss Lisa’s music class is a wonderful enrichment on Tuesdays and we are looking forward to what we will do next month with her! Thank you Miss Lisa! Posted on November 3, 2017 at 10:46 am. Sinking Salt- Density (10/5/17) The oil lies on top of the water. 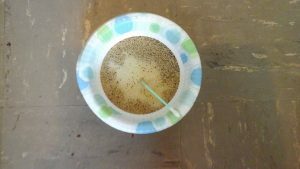 When we place the salt in the mixture, the oil and salt sink to the bottom. 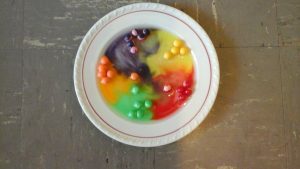 Skittles/Gobstoppers Candy Run-Water Soluble Materials(10/26/17) The colors run into each other and stop, initially forming perfect, colorful wedges. Because each color is coated with a thin layer of wax. The students loved this experiment and forming their hypothesis of what they thought would happen with the colors! Posted on October 6, 2017 at 5:46 pm. For the first month of art class, the students learned about primary colors, the color wheel, how we are all unique and using our senses. 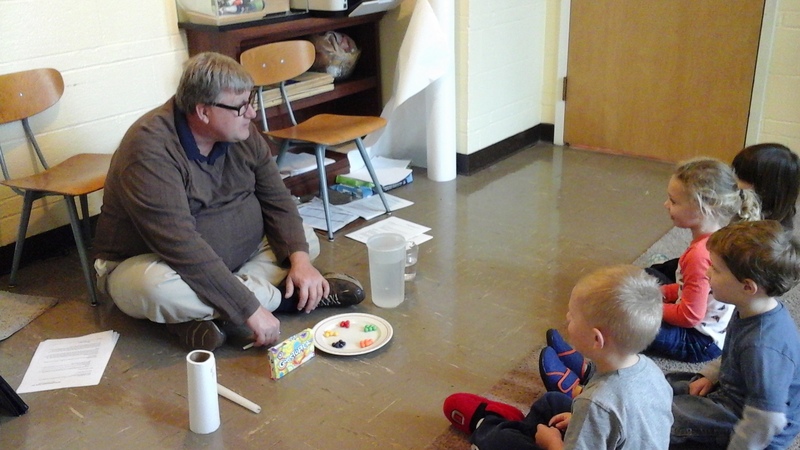 They also learned about two artists, Piet Mondrian and Henri Matisse. Henri Matisse was a French artist who was known for his use of color and for his paintings. Piet Mondrian was a Dutch abstract artist who had a huge impact on 20th century art. 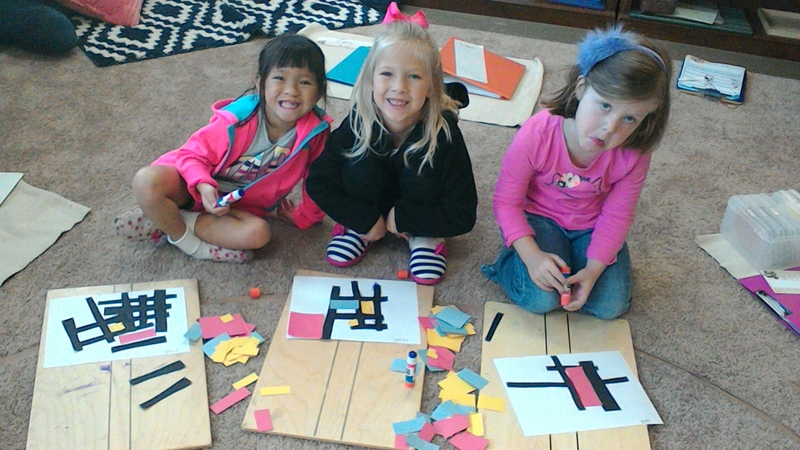 These students are working on renditions of Mondran’s Composition ll in Red, Blue, and Yellow. 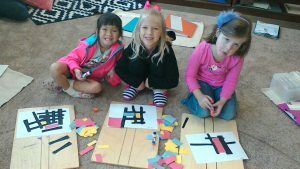 They learned about primary colors, lines, and how to use glue sticks with this project. The students learned what a self portrait is. 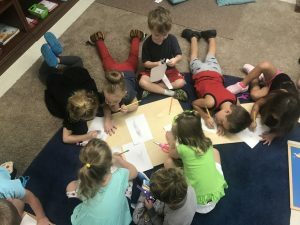 We talked about how everyone is different and special. They looked in the mirror at themselves and looked at their features. 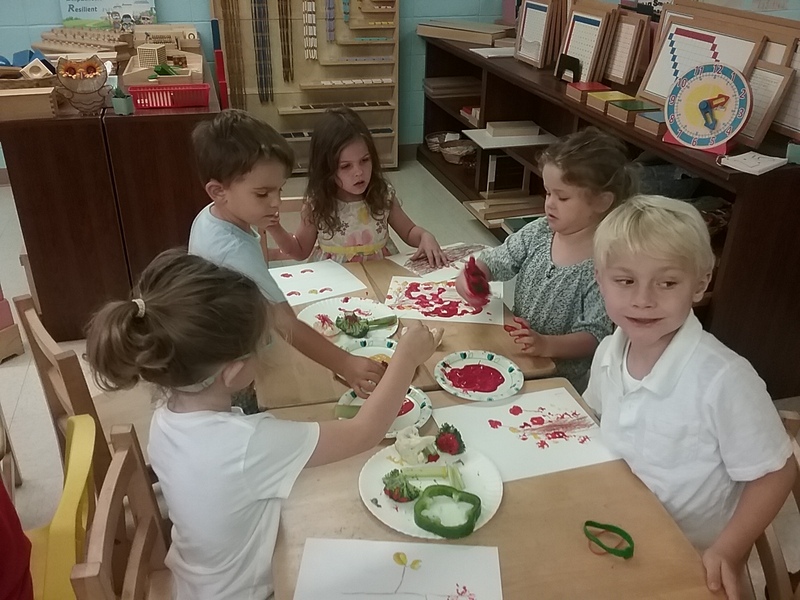 To celebrate fall, the young artists made fall trees using cut up vegetable to stamp in paint for the leaves. 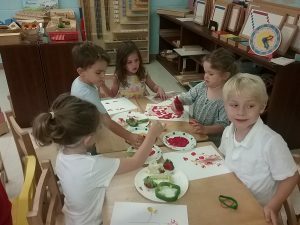 Since the theme that week was the five senses, we talked about how the vegetables looked, smelled, and felt. 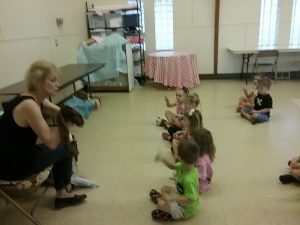 In September, the students met Ms. Lisa our music teacher, learned the rules for music, and how to use certain instruments. 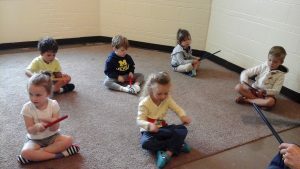 The instruments we learned how to play were rhythm sticks, castanets, and maracas. The students also learned musical terms such as staccato, legato, allegro, andante, and adagio. Singing hello to Allie the Allegator. 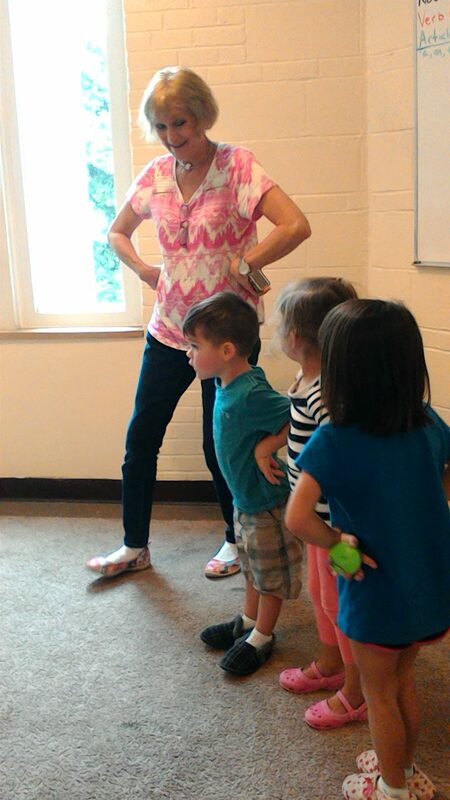 Ms. Lisa has the students watch Allie’s mouth while they sing hello to her, so they know whe to start and end singing. 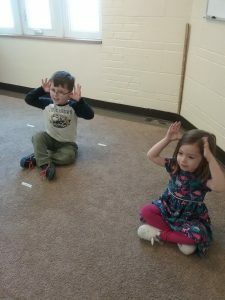 This teaches them how to follow directions and how to sing together like a choir. 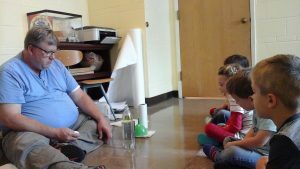 Using egg shakers to match the beat of the song. Using maracas to make the sound of a train. 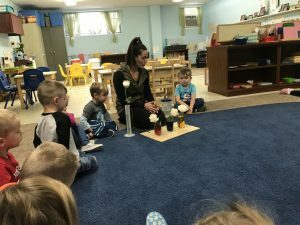 The students marched in a circle like a train and had to listen when Ms. Lisa rang the bell and played the train whistle to know when to start and stop. 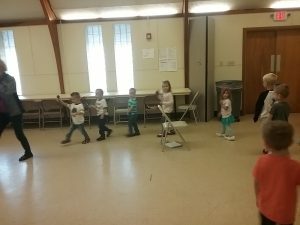 The song played in defferent tempos as well, so the students practiced walking slowly, at a medium pace, and at a fast pace.